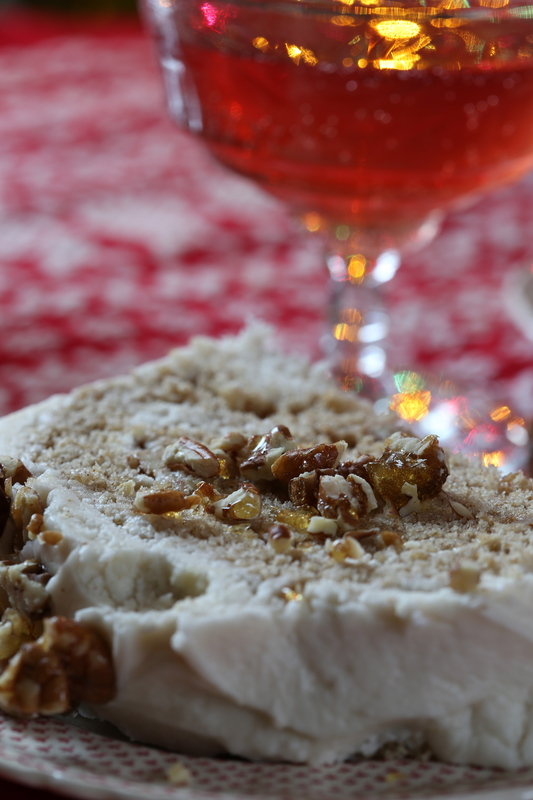 To keep it seasonal, the Tuesdays with Dorie bakers chose to make the Buche de Noel from Baking Chez Moi. This traditional holiday cake roll is frequently decorated to look like a tree log complete with textured bark, leaves, pinecones and even mushrooms. Thankfully, this rendition was much simpler and the only ode to the holiday was the gingerbread spices added to the cake. Just as you might expect, the holidays came and went faster than anyone could believe was possible. Why is that? Why are we in such a rush to get it done, get it finished so quickly that we scarcely have time to enjoy it? Whatever the reason, I propose that shift it into slow gear for next year, I would really like to enjoy the day a little more! Regardless, I finally had a chance to get the Buche de Noel finished although, it was two days after Christmas; better late than never, right? For those of us who work in or have worked in bakeries, we know that Yule log cakes are pretty common. Usually, it is a yellow cake spread with a thin layer of chocolate filling and rolled up so that a slice resembles the rings in a tree log. 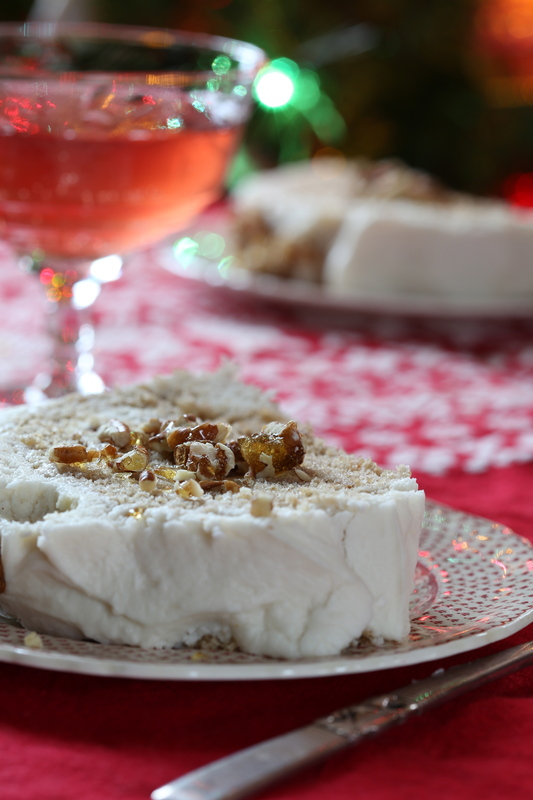 The recipe in Baking Chez Moi is unusual in that the filling is simply a mixture of cream cheese and butter sweetened only with a small amount of finely chopped pecan praline. 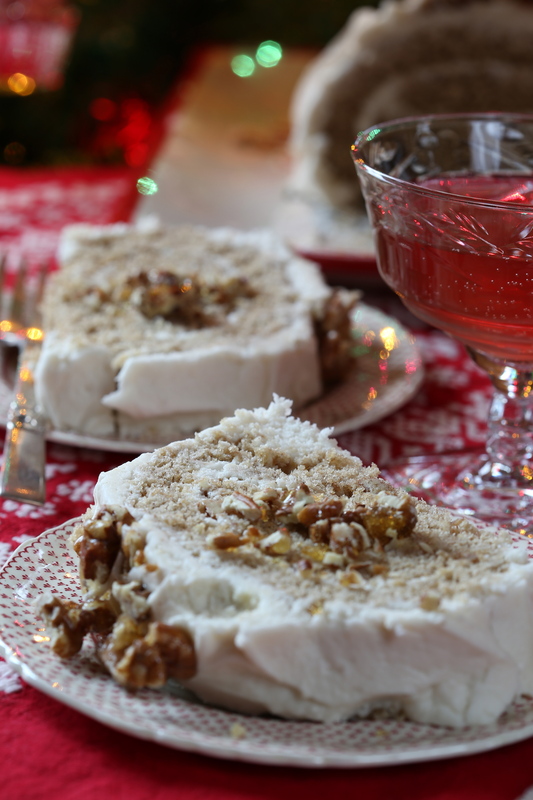 The differences continue with the use of a marshmallow frosting and a sprinkling of coarsely chopped praline pieces. 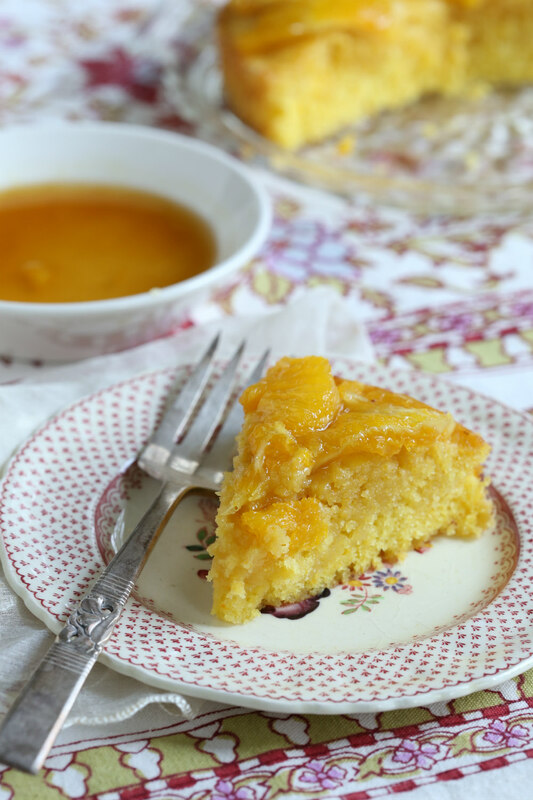 Somehow, the idea of spreading a mixture of cream cheese and butter into a delicate sponge cake seemed a little heavy to me and I knew I would be making changes. 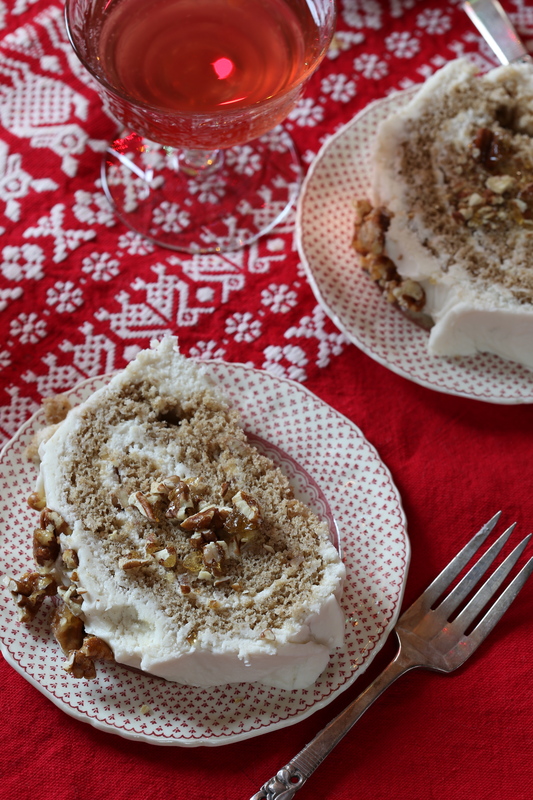 My choice was to whip up a nice, fluffy batch of cream cheese frosting and I am glad i did; we thought it was the perfect filling and frosting for my Buche de Noel. However, before I could do anything, I needed to get the cake baked and that my friends, was just the beginning of my troubles! To get things started, I decided to make the cake using my hand mixer because all of the parts of my stand mixer were in the dishwasher. Can I just say that using a hand mixer is not an option when making a genoise. No matter how much I whipped, with the beaters first and then the whip attachment, the eggs and brown sugar just never formed a ribbon which is essential for a genoise. In my opinion, the use of brown sugar did not help since I feel it affected the ph balance of the mixture and prevented the eggs from reaching the proper ribbon stage. My solution to the whole matter was to make the cake a second time but with a different method. First of all, I used room temperature eggs and white sugar. Heating the eggs and sugar and whipping them on high-speed is the common approach but my experience is that a better, stronger structure is formed from room temperature eggs whipped a little slower. Brown sugar is tricky to use in this instance simply because every brand is different. Have you ever held the different bags together and looked at the colors of them? Even bags from the same manufacturer can be a different shade when compared side by side. There just does not seem to be a true standard of color for light and dark brown sugar. In my book, it makes brown sugar a bit of a wild card and not my first choice for a recipe as fickle as a genoise. The fact that my first cake turned out to be a two toned sheet of rubber confirmed my suspicions and not only will I not use brown sugar but I will also not ever try this with a hand mixer either!! With a fluffy sheet of genoise cake subtly spiced with ginger, cinnamon, cardamom, cloves and black pepper, I set to work on rolling the sheet as per the directions. Can somebody please tell me why this is done? Over the years, I have made many rolls of cake without ever pre-rolling a single one. I’m sorry but if you ask me, it is a bad move. Just as I suspected, the cake cracked into pieces when I unrolled it to fill it. This really annoyed me after the trouble I had with the cake itself. In the future, I will store my layers in the fridge flat-out on a pan until I need them. As it was, I carefully spread some of my cream cheese frosting over the cake taking care not to damage it any further. 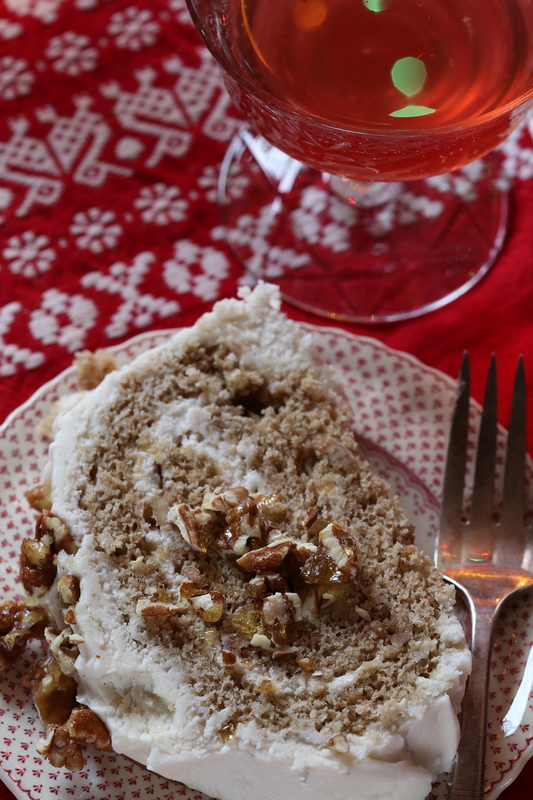 To keep it in the spirit of the original recipe, I sprinkled the finely chopped praline over the frosting and rolled the cake back up. Then to finish it off, I spread a generous layer of frosting over the entire log and topped it all of with the remaining praline pieces. So, here’s to a happy and prosperous New Year! Check out the Tuesdays with Dorie page to see how all of the other bakers made out with the recipe! 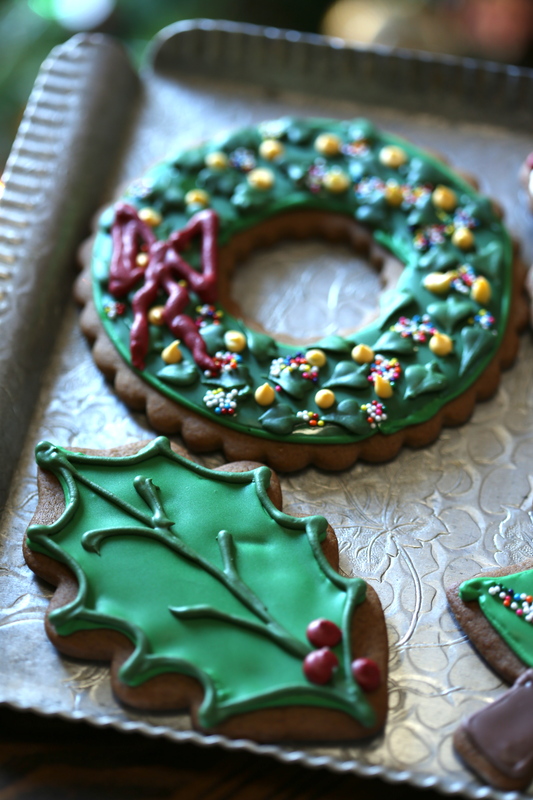 Fancy decorated cookies at Christmas are a given. 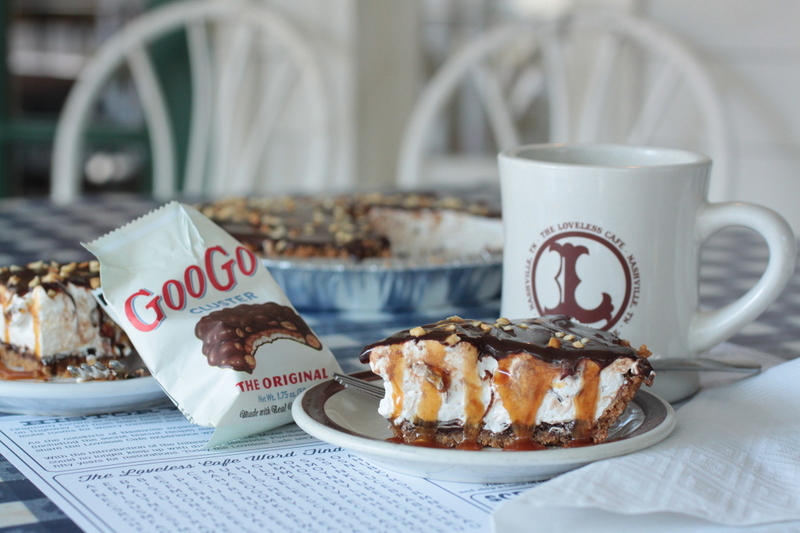 They can be found in stores and bakeries and even online. 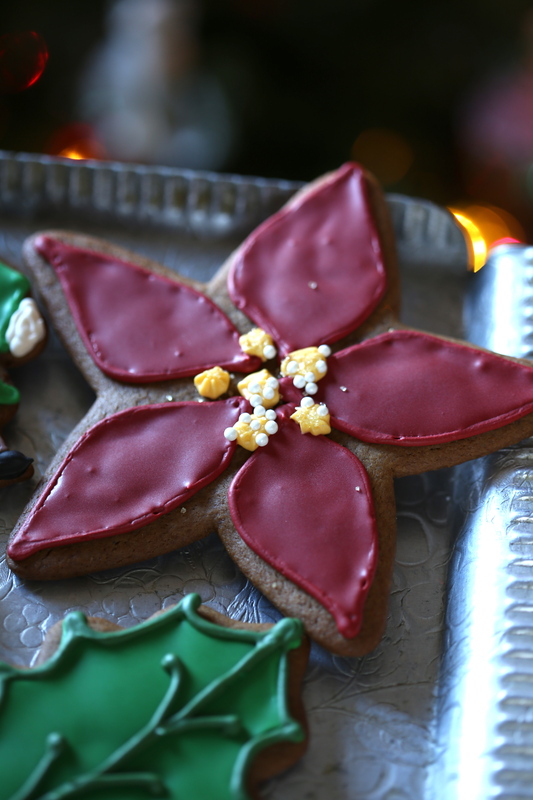 Good friends give them as gifts and others share them in cookie swaps. 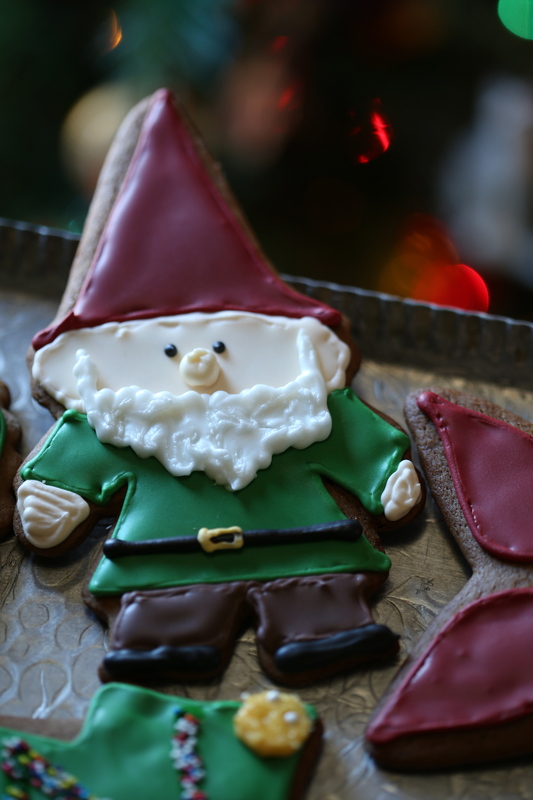 Our family is no different and we bake batches of them each year. Mainly, we share them with family and a few special friends. One family tradition we have is for our girls to decorate a batch of sugar cookies to give as a gift to their cousins each year. Truth be told, they go out of their way to make them the craziest, most outrageous and quite honestly, the ugliest cookies a trio of boys (“the cousins”) have ever seen. After dinner when dessert is on the table, many laughs are shared and many cookies are consumed. 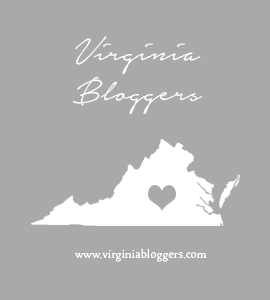 Now that we are in Virginia, our tradition of sharing them on Christmas day will not be possible. We will have to send them on to the boys via the post office and they will not arrive until after Christmas. Even so, all is not lost! Having a fair amount of time at home this holiday season, I was able to decorate a batch of gingerbread cookies to send out in time for the family Christmas dinner in Kentucky. This was the first time in a very long time that I had the time to give cookies any real thought. In the end, I chose some of my favorite cutters and let my inner Martha loose in the kitchen. Many batches of royal icing were whipped up and with my bottles of gel colors, I mixed up a rainbow of icing paints. After digging through my equipment, I found all of my couplers and tips and I got to work. The little nonpareils and white pearls just added to the fun and I was quite content to spend my day decorating cookies. One thing I generally avoid, anything with faces. While I can mix up colors and frost cookies all day, faces are not something I like to do; my skills just aren’t that good. At least until now, these gnomes were pretty easy to make and while they aren’t very lifelike, they are really cute! 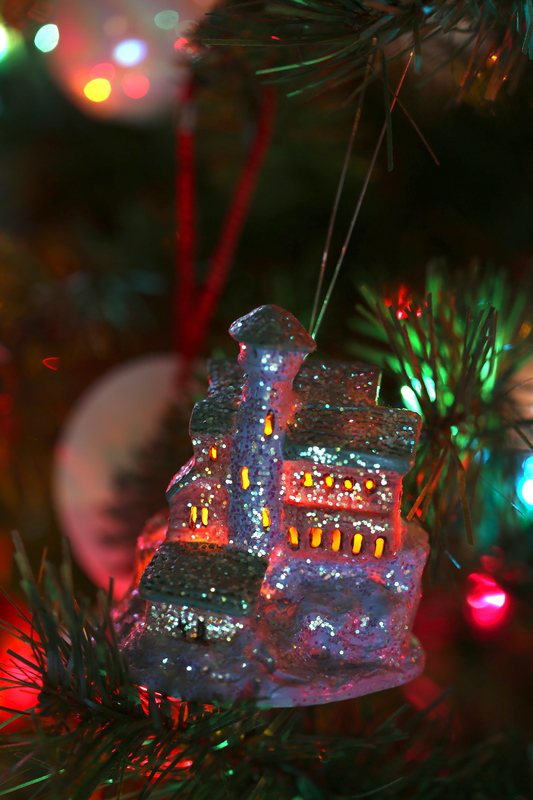 And since I was taking the photos with the tree as my background, here are a couple of my favorite ornaments. My collection has many glass ornaments, quite a few have been hanging on our tree for 30 years. For years, I have collected food ornaments and if you look at our tree, it is not unusual to find things like a head of garlic, a broccoli stalk or a can of soup hanging along with pretty glass globes. 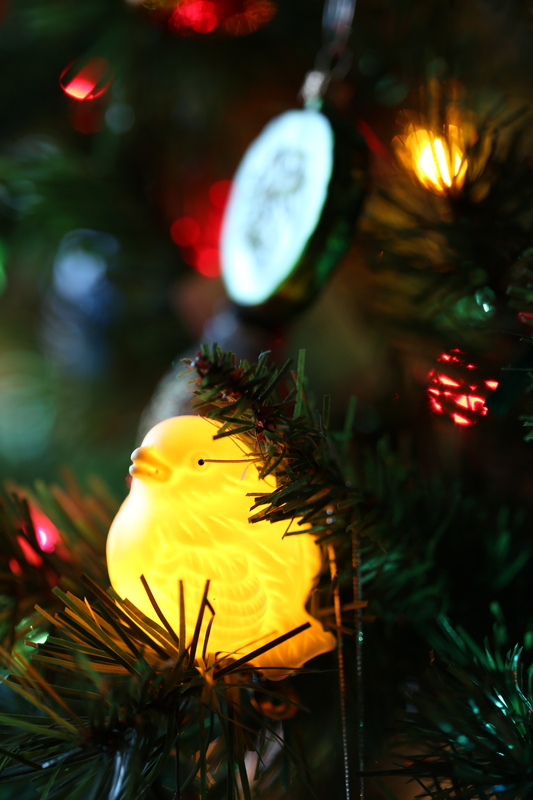 One of my favorite types of ornaments are the ones that slip over the lights and glow. This crazy one is a lighthouse and it is covered with glitter. This little bisque bird is a creamy white but it takes on whatever color the light is. This year, it is glowing yellow and I like the way it looks; the lighting shows off the feather details nicely. 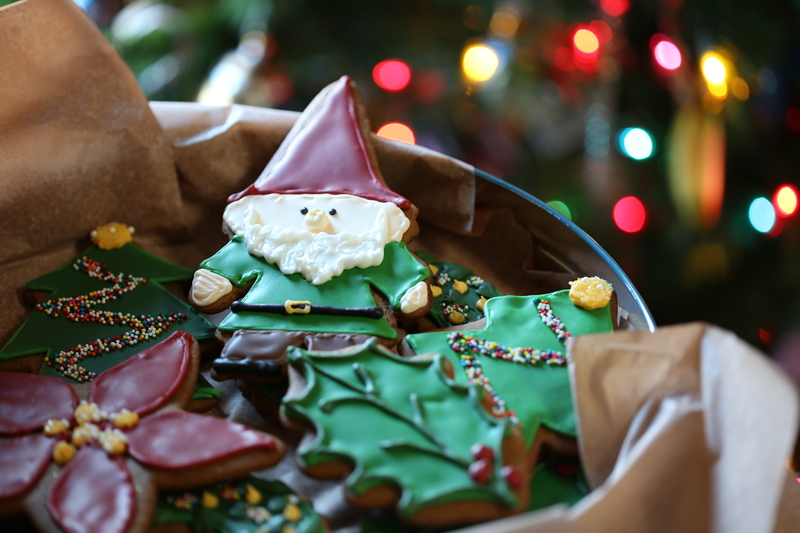 Here’s hoping you have a sweet holiday! Happy Christmas to all, and to all a good night!